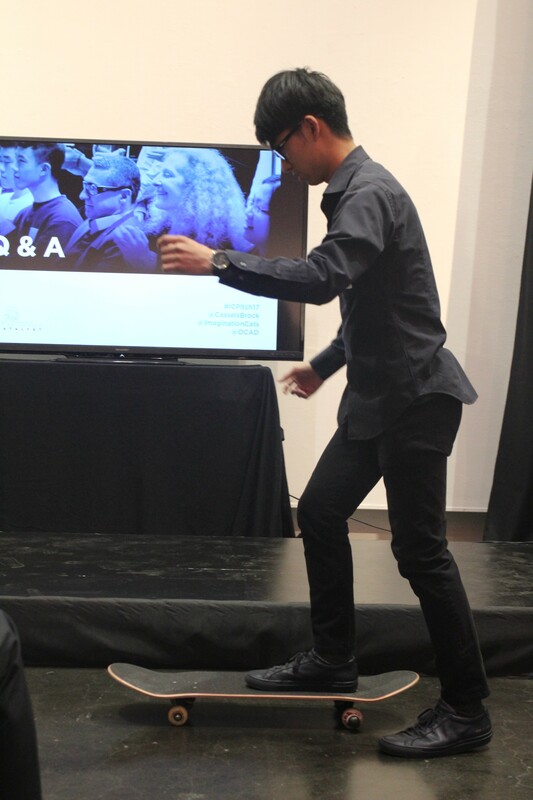 OCAD University’s newest entrepreneurs from the Imagination Catalyst squared off at the Cassels Brock Pitch Competition on June 15, competing for $5000 in start-up funding. Richard Revie and Victor Lam, founders of Primo, took the top prize, out-pitching their colleagues from OCAD U’s business incubator. Primo is a company that tailors to the initial fears behind skateboarding. The company has created a skateboard tool and a social platform to help people safely learn the sport. Imagination Catalyst is a creative industries, design and social innovation ecosystem at OCAD University that supports design-driven entrepreneurs from all sectors with learning, business incubation and talent solutions. In three minutes or less convey the essence of your Thesis or MRP to a panel of judges and a diverse audience using only a single slide. The best presentation will go on to represent OCAD University at the provincial finals to be hosted at York University on Thursday, April 19, 2018. The OCAD U 3MT Competition will be held on Tuesday, March 6th beginning at 1PM Room 322 at 230 Richmond St. W.
David Bateman is an arts journalist, spoken word poet, and performance artist. He holds a PhD in English Literature with a specialization in Creative Writing (University of Calgary), and an MA in Drama (University of Toronto). He has taught Drama, Creative Writing, and English Literature at a number of post-secondary institutions across the country - Trent University (Peterborough), Thompson Rivers University (Kamloops), University of Calgary, and Emily Carr Institute for Art and Design (Vancouver).Over the past thirty yearsHis performance work has been presented in Canada, the United States, and Europe. David has four collections of poetry (Impersonating Flowers, Invisible Foreground, 'tis pity, Designation Youth) published by Frontenac House Press (Calgary), as well as two collaborative poetry collections - Wait Until Late Afternoon (with Hiromi Goto - Frontenac House Press) and Pause (with Naomi Beth Wakan Bevalia Press). Performing the text will help you learn strategies to relax and prepare your mind and body for a presentation, connect your voice with gestures, hook your audience with a compelling ‘opener’ and rehearse techniques to minimize performance anxiety. Graduate students looking to enhance their general presentation skills or planning to participate in any knowledge translation communication challenge are invited (the 3MT® competition, Facilitator: Julia Course, a graduate of Brock University, holding an honours B.A. from the Department of Dramatic Arts and a minor in English Language and Literature. Deadline for Submission of Application Form - Monday, March 5th, 2018 at 11:59PM. The top presenter will receive $750 as well as training and travel support to attend the regional competition at Waterloo in April. The runner up will receive $500. The "People's Choice" award winner will receive a $100 gift card. This award is voted on by the audience. At every level of the competition, each competitor’s presentation will be assessed according to the criteria listed below. Please note that each criterion is equally weighted. Did the presenter clearly indicate what was significant about this research? Was the presenter careful not to trivialise or “dumb down” the research? Would the audience want to know more about the speaker’s research? Was the thesis topic and its significance communicated in language appropriate to a non-specialist audience? Did the speaker use sufficient eye contact and vocal range, maintain a steady pace, and a exhibit a confident stance? Did the presenter spend the right amount of time on each element of the presentation – or did the presenter elaborate for too long on some elements or was the presenter rushed to get through the presentation? Did the slide enhance, rather than detract from, the presentation; and was it clear, legible, and concise? A single, static slide is permitted (no slide transitions, animations or movement of any description are allowed), and the slide is to be presented from the beginning of the oration and remain in view for the duration of the oration. No additional electronic media (e.g., sound and/or video files) are permitted. No props (e.g., costumes, musical instruments, laboratory equipment) are permitted. Presentations are to be spoken in standard oratory prose (i.e., no poems, raps, or songs, other than those that may be the target of research). Presentations must be made by memory; notes may not be used. The competition will be administered in English. Students must be registered in a master's (Thesis or MRP) program at the time of the 3MT® competition, and must have made substantial progress on their research and analysis. Course-based master's students are ineligible. Room 322 at 205 Richmond St.
Six OCAD U entrepreneurs took part in the first-ever Imagination Catalyst investor event on Tuesday, November 29. All of the entrepreneurs who pitched had attracted investment prior to the IC Investor Night. All made new contacts at the event and are scheduled to have follow-up meetings with potential investors. Imagination Catalyst is OCAD University’s entrepreneurship and commercialization hub. Our diverse portfolio of companies apply design thinking to make lives better, create richer experiences and bring leading-edge innovations to market. The Umbra store on John St. was packed with some 90 spectators for the Imagination Catalyst’s fourth annual pitch competition on June 14. Tanner Wills Short, founder of Bowtie Interview Tool, took the top prize of $5,000, out-pitching four of his colleagues from OCAD U’s business incubator. Bowtie is a puzzle-like toy that allows employers to determine the strengths of potential recruits during job interviews, rather than relying on common personality tests such as the Myers-Briggs Type Indicator. Bowtie can also be used as a team-building activity to improve workplace culture. Short, a 2016 graduate of OCAD University’s Industrial Design program, studied play theory to come up with his product. The Imagination Catalyst is based in a 3,000ft2 co-working space at 230 Richmond St. West. 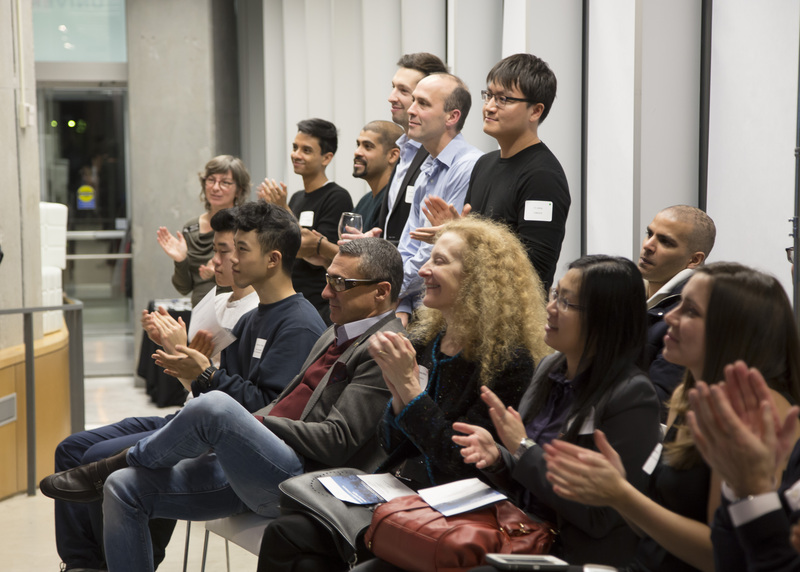 Currently, there are 77 jobs associated with the companies participating in OCAD U’s business incubator program, which has recently received renewed Campus Linked Accelerator funding from the Ontario Centres of Excellence. Mary Baumstark (MA 2016), graduate student in the Contemporary Art, Design and New Media Art Histories (CADN) program will join 20 doctoral and master’s degree students from across Ontario to present their research at the provincial finals of the Three-Minute Thesis Competition (3MT Ontario) on April 14 in Waterloo. Baumstark’s thesis “Craftivist Clay: Activism and Resistance in Contemporary Ceramics” was written under the supervision of Dorie Millerson, Chair, Material Art & Design. Mary competed with nine other graduate students at the OCAD U 3MT Competition on April 6. The judging panel included OCAD U professors Anda Kubis, Jana Macalik and Sarah McLean-Knapp. The 3MT is a communications competition for graduate students. Developed in Australia by the University of Queensland in 2008, it challenges students to explain their research in plain language in just three minutes. The 20 competitors on the provincial level are all winners of local competitions hosted by every university in Ontario. The 3MT is hosted by Wilfrid Laurier University and is open to the public. The event will be livestreamed starting at 10 a.m., on Thursday, April 14.